Colus has quickly become one of my favorite designers and t-shirt brands over the last few months. The simplicity yet boldness of his illustrations really caught my attention. I bought 4 of the 7 shirts he originally had available with my first purchase and have since ordered every product he’s put out. I’m happy to announce the release of his newest design, “hunter”. 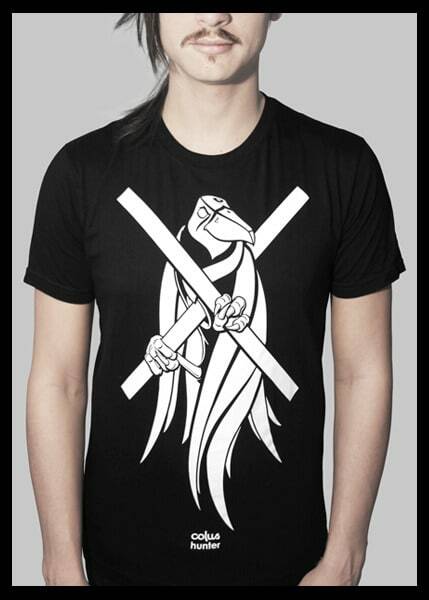 Third of the white on black and ninth of the total shirts, “hunter” marks the 10th product Colus has released. The non-shirt item being a print of his “wise owl” design. With high quality prints on American Apparel shirts, I highly recommend picking up one of these original designs. You will not be disappointed. Always love simplicity and boldness too, i like it!! Previous post: Say Hello to your Hide Your Arms writing team!